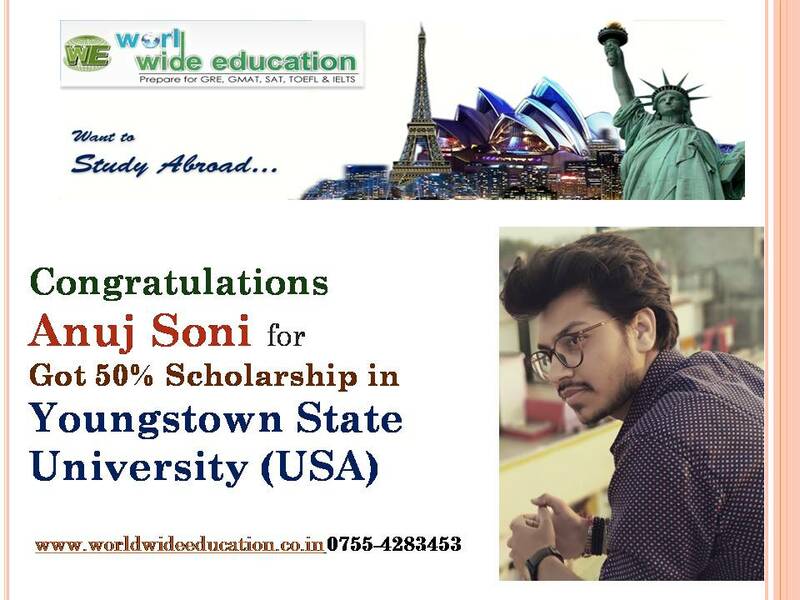 WORLD WIDE EDUCATION proudly announces the achievement of our student Anuj Soni who recently bagged 50% scholarship for study in Youngstown State University, USA. Its ranking in USA is 74 in Engineering Programs. His performance in SAT and TOEFL examinations is commendable. Anuj started preparing for SAT and TOEFL examinations with WWE when he was pursuing 12th grade from Bright H.S. School Ushaganj, Indore. For his undergraduate programme (Geology and Earth Science), his tuition fees is only $ 7600 which is equivalent to Rs. 4,88,000 per year, which is very reasonable compared to Indian institutes such as IITs. Our impeccable guidance and counseling along with his quality of clearing every doubt has helped him come out with flying colors. It takes a lot of sweat, determination and hard work to turn a dream into reality. WORLD WIDE EDUCATION wishes him the best for future endeavors.